Level lake frontage! Sandy lakeside campfire area. Clean & comfy home. Located on beautiful Bass Lake, you get the tranquility of a 278-acre lake with the convenience of being minutes from Eagle River. This ranch-style, one level, lakefront home with level sandy swimming beach is perfect for family fun. Catch a fish off the private pier or 14' V-hull fishing boat with oars and anchor. You can bring you own outboard motor or rent a 15 horsepower or less from the nearest marina, Boat Sport in Eagle River. Lounge on or leap from the large swim raft. Max lake depth is 16' - plenty deep for water skiing and tubing. If you bring your own boat, you may tie it at our private pier. We take the pier out any time after October 15, so if you choose this time period, the pier and boat may or may not be available. This lake has no public access, but you may pay for and use the boat launch at Big Bass Resort. It is available from Friday through Monday during the month of May. Starting in June, Saturdays will be the best time to launch boats. The cost is apx. $10 if you do not need help and apx. $25 if the tractor is needed. Please call Scott Reppert at 1-815-218-6335 prior to launching your boat. Scott has made his site available to all lake residents as a courtesy so please respect this privilege and the launch/retrieve times. Meanwhile, back at the ranch, lounge in the Adirondack chairs on the spacious new deck and enjoy four patio chairs for the lakeside campfire area. When it is time to relax inside, you will love the home’s open floor plan and fully equipped kitchen. Yes, of course it is equipped with a new fridge with ice maker - after all, you are on vacation! The dining and family room has a stone fireplace and Dish TV. In addition, there’s a spacious great room, perfect for reading or game playing. Relax and savor the magnificent view of the lake through the expansive windows or while enjoying a meal outside on the large lakeside deck. Picnic table, charcoal grill and fire pit are there for your pleasure. This home is an excellent getaway for spring, summer and fall retreats. 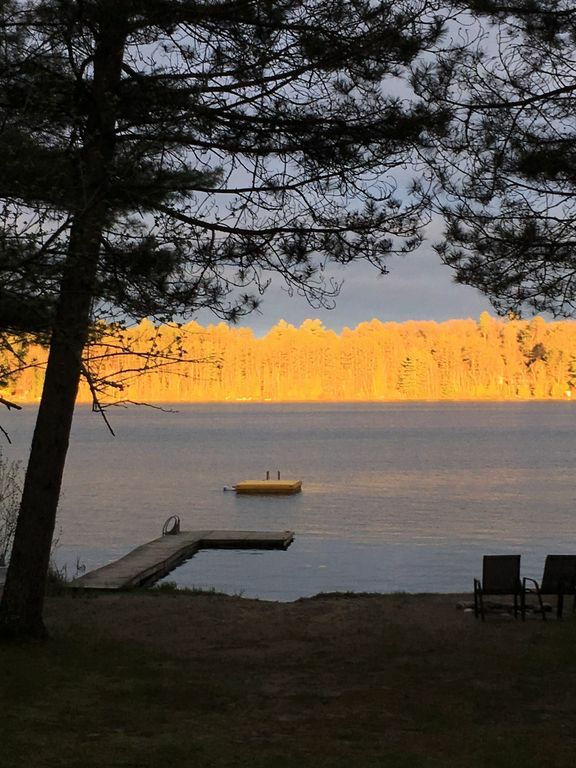 The colors in the fall are exquisite as the home and lake are surrounded by maple, birch and towering pine trees. Fish, visit the Cranberry Festival or hike the trails of the nearby Nicolet National Forest. Summer temperatures are generally very comfortable with the lake nearby dual sliding glass doors and screens. We also have ceiling fans, portable fans, and a table top fan in each bedroom. Our check-in is after 3 pm. Check-out is before 10:00 am so we can have it neat and tidy - just like you will find it. June, July and August book for a weekly rate only. However, if the calendar still shows an opening within two weeks of your arrival, you can reserve a three night minimum stay. If you can't stay the whole time, no problem, there is a lockbox entry code so you can arrive any time after 3 pm. Your $500 damage deposit is returned if you depart by 10:00 am, general clean up is done, and no unreasonable wear and tear occurs. Expect your damage deposit back about 14 days after you depart. Our rates include taxes and cleaning, and a max occupancy of eight people. Year-round adventure, peaceful relaxation and lifetime memories await you. The master bath has a shower stall and two doors-one to the master bedroom, and the other to the kitchen. The full bathroom with tub is down the hallway, between the bunk bed room and the double bed room. Campfire pit lakeside on small sand beach. Private pier & swim raft. Two person swing. Maximum lake water depth is 16'. Two adirondak chairs and four patio charis for your use. We don't allow rv's/campers/tents overnight. Please bring your own lake towels. We provide towels for inside the house use. Additional living room area with regular sofa and tv, bar, laundry in one side of home. New in 2014 with ice maker. Ceiling fan/light over kitchen table. Kitchen table seats six. Den table seats four. Additional picnic table on lake side deck. One in the living room with the pull out sleeper couch and another in the den/bar room. HDMI. Enjoy some of our library and use either the dvd in the living room or bar/den area. Blu ray player. Second den has sliding glass door to porch, tv seating area, bar area, card table. You are welcome to use anything in the garage. Use our DVD's or bring some of your own. Use our row boat and/or you can bring your own boat and coordinate launching at www.bigbassresort.com and pay their launch/retrieve fee. We provide patio chairs by the firepit area or you can move them to the deck, The new in 2014 deck lakeside has a nice picnic table and built in seating on the perimeter. Two adult life jackets provided, oars, anchor for row boat. Our Great Room is stocked with books and board games for your enjoyment. Play outside on the swim raft & pier, and fish off the 14' flat bottom boat with oars. We have a private pier and you could also tie up your own boat as well as ours that is included with your rental. Big Bass Resort on the west side of Bass Lake offers boat launchings at certain hours, mostly Saturdays, for a fee. Contact them at info@bigbasslakeresort.com to schedule and check current fee. Though we don't have air conditioning, it is rarely needed. We have the lake side patio doors and windows as well as two ceiling fans and three portable fans. Wonderful place for a vacation!! This is our second time staying at this property and we plan to be back again! Lovely, clean, and very spacious home with stunning views. We caught tons of panfish from the pier, and some nice bass out on the lake, too. Fireplace was perfect on the chilly nights. Property managers are friendly and helpful, and respond quickly to messages and questions. Overall just a great place for a couple or a family. Yes, I thought you would like this home, Jessica. It is very private and peaceful. Glad you found it clean and to your liking. We are always especially happy to help you. Thanks for staying with us again! This was our 6th year staying in this lake house. We love it! The house is clean and comfortable. It's well-stocked with linens and the kitchen has everything you'll need to cook and eat. The lake frontage is level and sandy. There are beach chairs and a fire pit near the shore. We enjoy kayaking, fishing, and biking in the area. The house is close to Eagle River shopping and dining. Nothing negative in our review. You guys are the best! Six years! Wow! We're proud that you've chosen our home to make yours for six summers. Thank you very much for your review. I won't bother saying, "Come again!" - you already know we are hoping you make it seven! The cottage was clean and well-stocked with linens and everything you might need to cook and serve a meal. The furniture in the cottage is well-kept and comfortable. We enjoyed fishing (caught some pike, crappies, bass and blue-gills), kayaking, biking, and just relaxing on the beach or around a campfire in the evening. The cottage is a short ride to Eagle River for groceries, dining or shopping. This was our fifth stay and we have already booked for next year. Big grin here! Glad to have our number one guests back! Beautiful place, breathtaking views, and unforgettable moments! Great to hear. I think it would be impossible to count up the great memories made there. Hope you will come make more! We had a great time on this property. The cabin was clean and well maintained. The lakefront, yard, and deck we great. My kids bad so much fun running around and playing in the yard and catching pan fish off the pier. We would definitely stay again! I thought you would like it, Mike. We've torn up and voided your damage deposit as planned. Let us know what you need in the future. We're happy to help and happy that you had a great time! My family of 6 had the best time this summer! The house fit us all perfectly! We had campfires every night and tubed on the lake all day! My older boys (14 and 11 yrs old) enjoyed using the John boat w/ oars for gills...and my younger 2 (3 and 2 yrs old) caught tons of gills off the dock! Can't beat a week of relaxing up north! Perfect! Just what I like to hear. Yes, the level easy access to the beach area, firepit and pier cater to everyone. I love water skiing in this lake - so clear. Enjoy winter fun of snowmachines, sled races & cross country skiing, with downhill nearby. Great location for Pond Hockey in February and Cranberryfest in the fall. We have a lockbox entry system, so you may arrive late or on a later day. June-August, we only offer a three night minimum rate if it is within two weeks of your visit. May, Sept, and October offer three night minimum rates. We are open for long term rentals November through May. Contact Northern Knights Services directly. nks (at) alphacomm.net, for good customer discounts.